She's funny, she channels emotions we all share but tend to hide, and she's a cat. 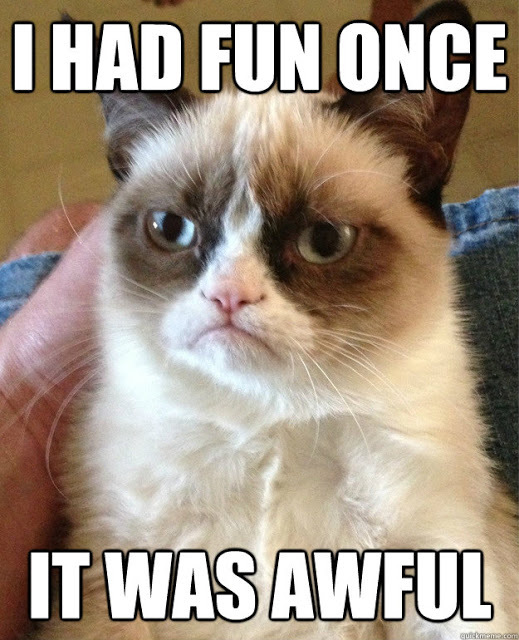 Is it any wonder that the internet loves Grumpy Cat? It was only two months ago that Bryan Bundesen (Cataliades) posted a picture of a cat to reddit with the words "Meet grumpy cat." This is the picture that came up. From that point (September 23rd), the little cat with the downturned mouth and the frowning eyes became an internet sensation. Immediately, redditors began contributing image macros, putting words into the cat's mouth. 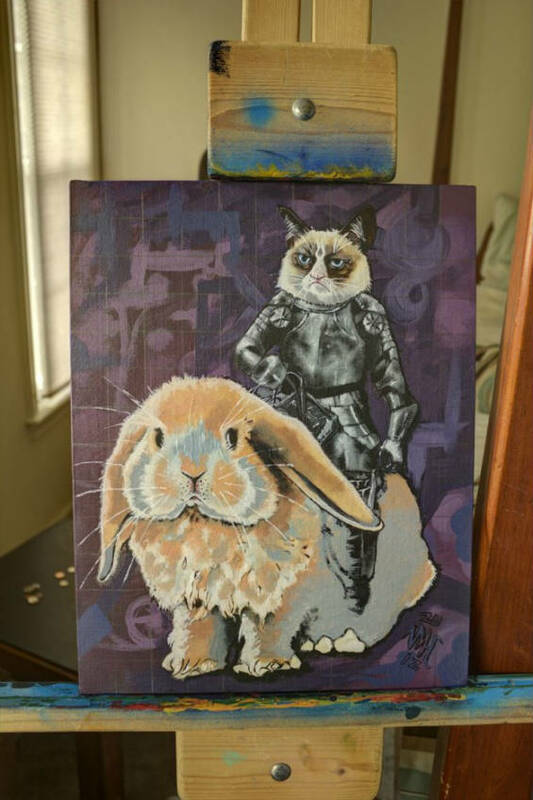 Pretty soon, there was a subreddit dedicated to Grumpy Cat and the image macros she generated. Bryan posted kitten pictures and videos to prove the cat was not a product of Photoshop. The cat, which belongs to Catalaides' sister Tabatha, is named Tard, short for Tardar Sauce. It was later explained that Tabatha's young daughter compared the kitten's color to tartar sauce. She wrote it down as Tardar and the name stuck. 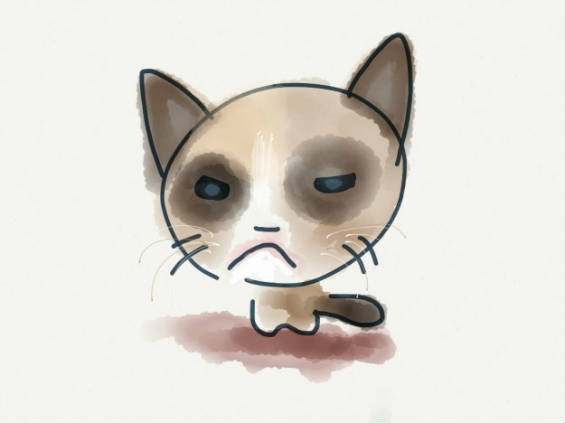 You can see more videos of Grumpy Cat at Bryan's YouTube channel. 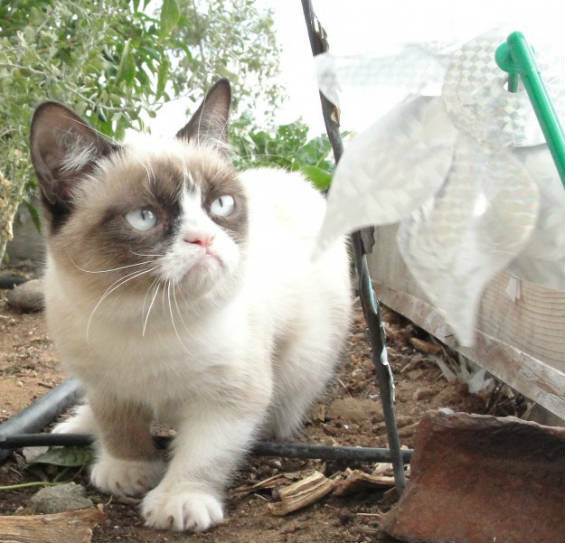 Grumpy Cat is now about seven months old and is the product of two very normal house cats. Her legs are short and don't work as well as they should, but the vet says she is in no pain. 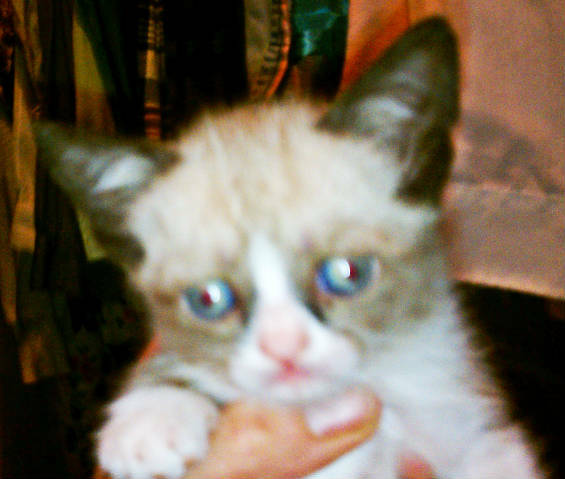 The way her face looks is inborn, as you can see from some kitten pictures. One of her brothers, Pokey, presents the same oddities to a lesser extent. 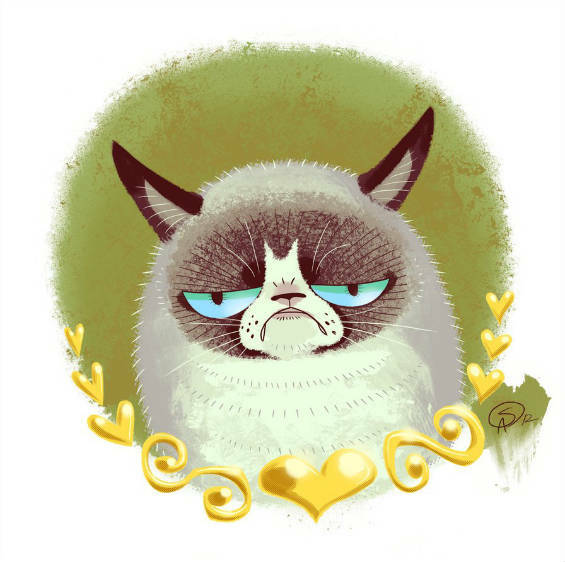 Tabatha Bundesen, who owns Grumpy Cat, began a Grumpy Cat blog on September 28th. It now contains 34 pages of photographs, videos, fan art, and products that sprang from the Grumpy Cat meme. A Tumblr blog followed on October 9th. 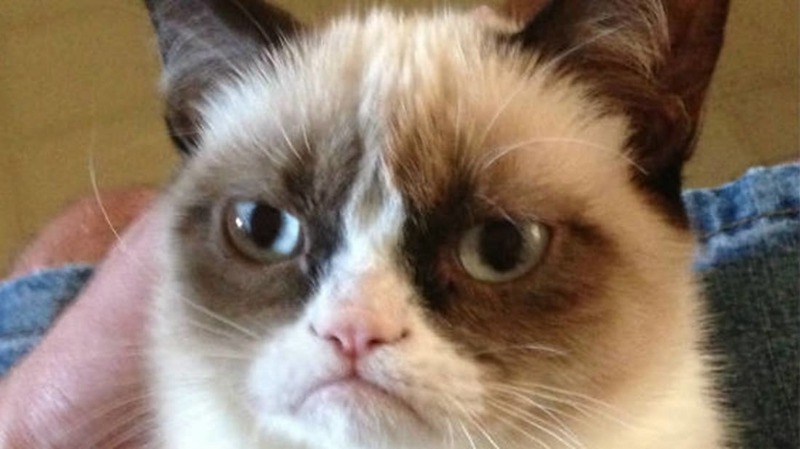 Grumpy Cat also has a Twitter feed. 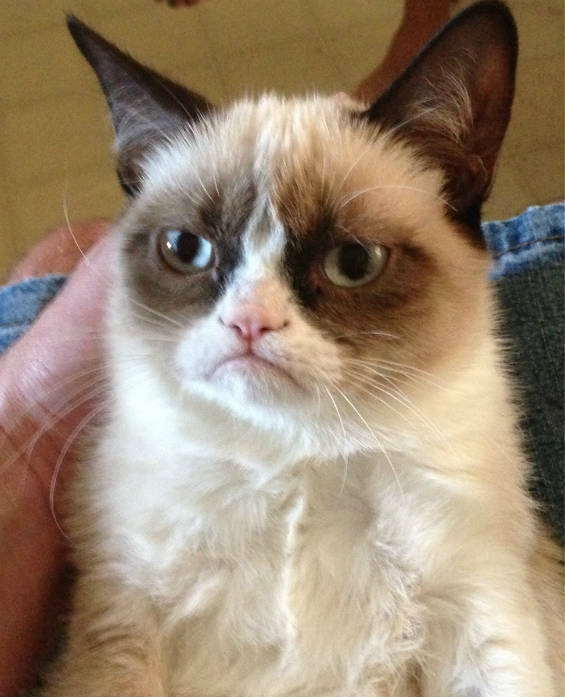 Through regular updates, we see that Grumpy Cat isn't really grumpy. She's a laid-back, sweet cat that just looks grumpy. All the time. Tabatha says that the other cat Pokey is grumpier. 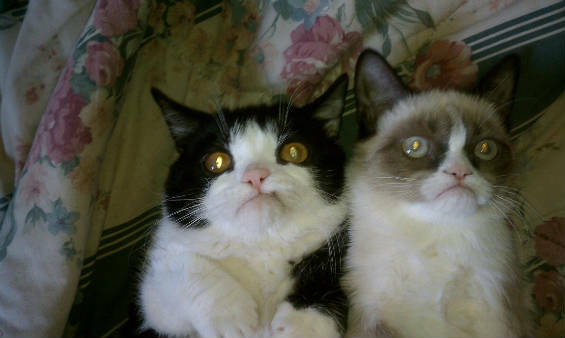 As the meme spread rapidly around the internet, Tabatha and Tard were contacted by TV stations to make appearances and answer questions. T-shirts followed, and are selling like hotcakes. 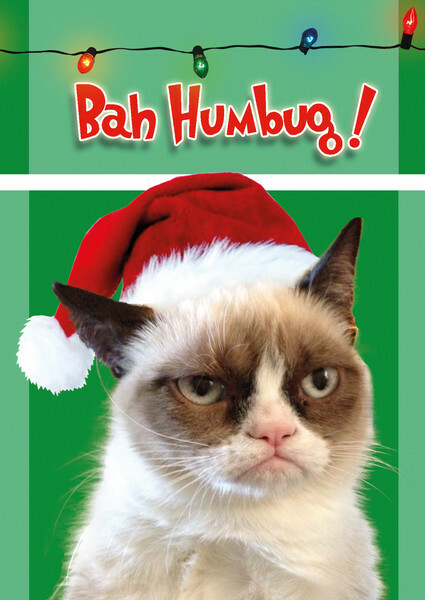 But the hottest products right now by far are the Grumpy Cat Christmas cards. There are several styles (and more on the way), but they won't last long! 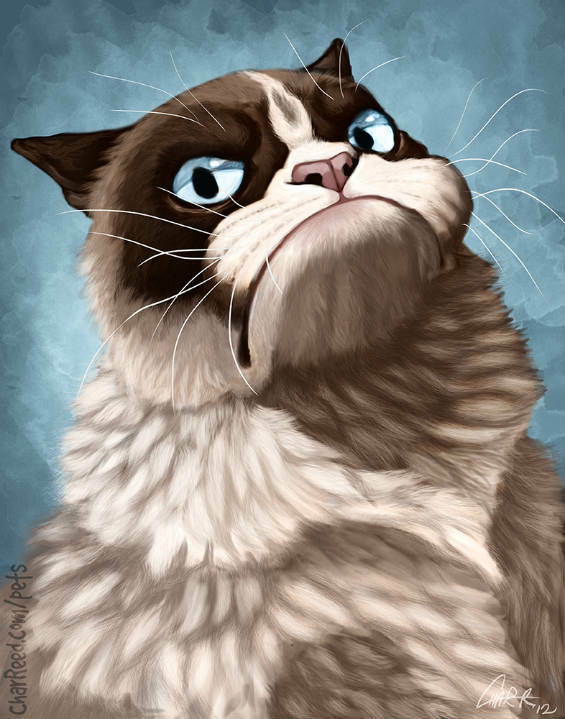 A portion of the proceeds from all Grumpy Cat products go to animal shelters and cat charities. DeviantART member Gantzcraziness created this loving homage to the cat. She seems at home as a knight on a rabbit, as painted by Vincent M Hall. A caricature by DeviantART member charreed makes Tard appears as big and tough as she might imagine herself to be. 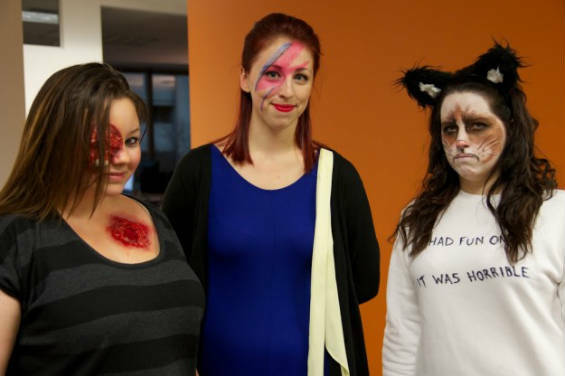 Ashlee dressed as Grumpy Cat for Halloween! 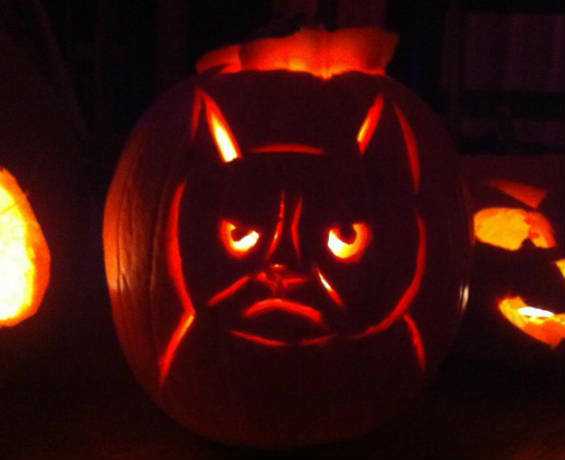 There were Grumpy Cat pumpkin carvings, too. This one is by redditor MrNoMoniker. There are others, too! They are called "grumpkins." 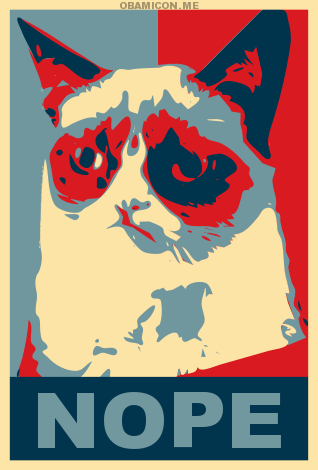 Redditor stept rendered Grumpy Cat's image into a Sheperd Fairey-esque political poster. 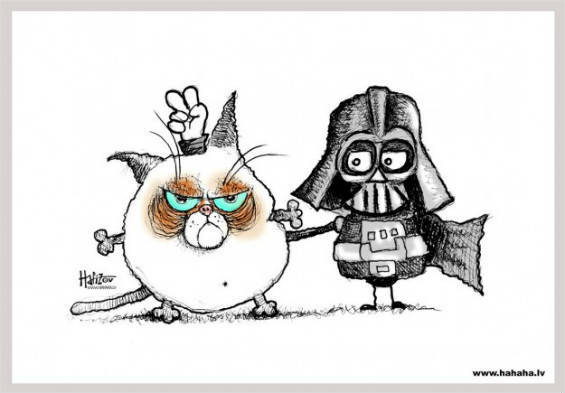 Russian cartoonist Pavel Hafizov put Grumpy Cat into the Star Wars universe. Oh, there's lots more. You can see an archive of fan art at Tard's site. There's no way to manufacture a perfect meme. In most cases it's impossible to predict what will become hot on the internet. In the case of Tard, everyone who opened that first picture knew she'd be a star because that face makes you laugh out loud -and not feel guilty about it because she's a cat, and a pretty happy, well-adjusted cat at that. Our laughter isn't going to hurt her. 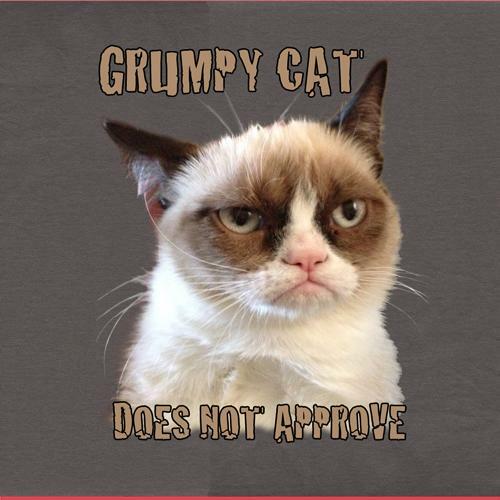 Still, the rapidity of the spread of Grumpy Cat to all corners of the internet is astonishing. Her fame as a meme may die out sooner or later, probably when the next funny-looking animal comes along. But we can look at her and giggle and wish her a long and happy life. See articles on other memes: Nyan Cat, The LOLcat of Death, You’ll Like This Alot, 6 Founding Members of the Internet Zoo, and All Hail the Fail Whale!